Frenchie here to teach you all how I color ribbon with blendabilites. 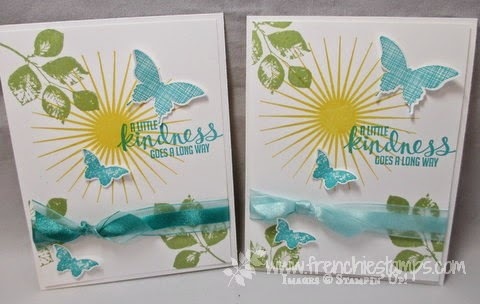 How many time you are making a card and want to add ribbon but you don't have the color you wish to use. Well this technique will give you the choice of many color ribbon with only the White Organza ribbon and blendabilites. You can get 3 tone of color on your ribbon with one pack of blendabilites. You can see in the second picture it is the same pack of Coastal Cabana that I use to color my Organza ribbon and I have 2 different color one is like the coastal cabana and the other goes perfect with Bermuda Bay. It is very simple to color just use the brush tip and brush softly on the ribbon. 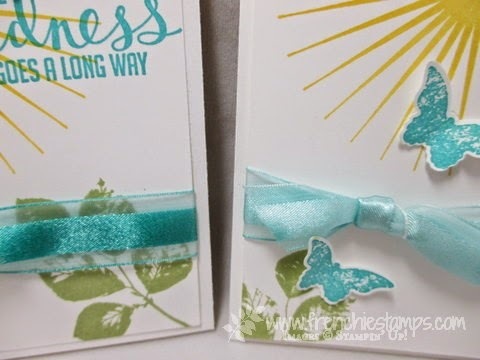 I have a video HERE to show more detail on how to color your ribbon. 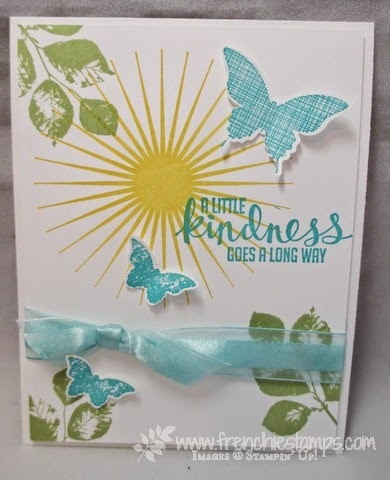 This card is very simple with Kinda Eclectic stamp set color of ink that I use is Coastal Cabana, Pear Pizzazz and daffodil delight on whisper white card stock. Well my pals this is it for my share now make sure to visit my blog to see Tina lovely creation. CLICK HERE to view Tina creation.